Jeux de peau is a perfume by Serge Lutens for women and men and was released in 2011. The scent is gourmand-sweet. It is being marketed by Shiseido Group / Beauté Prestige International. The spirits divide over liquorice, the spirits divide over a liquorice scent as well. Above the town there is an ancient fortress and in the street there is a brewery. The scent of malt, yeast and barley spreads over the city. I go for a walk and wherever I go it smells like bread and dark beer. Mmmmh. Jeux de Peau reminds me of my time in Edinburgh, whose scent has burned itself into me, whom I have learned to love. What the key question is: Does a perfume need flowers and blossoms & does a perfume need musk? I remember a rather unpleasant bus ride, an experience that many people probably know in a similar form: A somewhat older lady with a lot of thunder is sitting next to me and a cloud of sweet rose-amber-something is wafting around her. The air stays away from me, but unfortunately it blocks the escape route. All right, be brave, hang in there. In my fantasy the woman is apparently associated with a dog rose... D but seriously, that's how such an over-fragrancing with flowers affects me. I like the smell of skin. Skin smells nice. (All who have babies and / or beloved partners can certainly confirm this). Do you always have to be able to perceive a perfume as such? I would argue that Jeux de Peau is not trying to do exactly that. It's coming the other way. Intensify skin odour & highlight different aspects of it. Whether you like it is another matter. For me, wearing Jeux de Peau means wearing the scent of the city. When I close my eyes, I see them in front of me. The brewery, the asphalted streets, the warm dust on the sidewalks, the smell of the bakeries, bread, Danish Danish pastries, old bricks in the sun, salt liquorice, hot milk from the cafés... warm skin? Delicious bitter notes, very gently rounded off by sweet milk. The salty liquorice brings the tension. It doesn't smell like skin to me, I don't think Lutens & Sheldrake wanted to try it either, but the fragrance is composed of notes that I feel come from a similar fragrance category to skin. Maybe that's why the "Jeux" in the name, the gimmicks. I smelled this perfume from a tester at the market (funny place to find this expensive fragrance!) and sincerely I can't say if I like it or not: this scent is too particular , with the wheat and spicy notes combined with flowers, fruits and milk. A "melting pot" not easy to wear. Maybe my tastes are too traditional , but I don't think that this fragrance is one of the Serge Lutens' masterpieces. Oh how I feel in the evening - when the bells ring at rest - bim bam. So it says in a German folk song. But I'm not at all comfortable in the evening, because a noisy party is going on in the neighbouring garden, accompanied by umtata music, yelling, and coke wads from the grill. These sensory stimuli spread throughout our rooms and, to say the least, are somewhat disturbing. But I'm not a buzz kill, and instead of picking up the phone, I'd rather pick up Jeux de Peau. On the tester was written: The Comfortable . One would like to lay oneself in this loudly painting word already. So also in the fragrance. According to Lutens it should remind you of freshly baked bread, but I rather see the picture of the soft bread dough during the preparation and when it is resting. My husband is the baker here, but I always like to watch him knead lovingly. Creamy milk is mixed with grain and sprinkled with lemon. Cinnamon and clove give warm spice and noble osmanthus is in the air. Apricots shine in the wooden bowl - and even the husband swings the wooden spoon. The kitchen is the most beautiful room in the house. Outside, the party people get sentimental and start to sing sad tunes. Maybe : Oh how I feel in the evening .... ? Whatever’s in this fragrance conspires to smell like a bakery. Looking it up, Serge wants to conjure not just the smell of warm bread, but the feel of it on a cheek. Childhood memories. How he managed to simulate this uniquely French smell I can’t imagine—this is definitely a baguette, not for instance a ciabatta. Check out the many notes. Oh, what’s that technology called? Head space. It may have been that. Must have been. Either that or a great deal of experiment. How else know these unlikely notes would yield the unmistakable smell of a baguette? Is it wearable? Not for me, but it’s quite smellable. Like similar compositions of his, Jeux de Peau is subdued but accomplished. — from June 7, 2015 forum sniff fest. Composing a gourmand fragrance is, in my opinion, a true test of the perfumer's craftsmanship. I've sampled a number of food-inspired scents, most of which are sweet, typically in a loud kind of fashion. This discovery suggests that their primary (or the only?) goal is to make their wearers as well as the (lucky?/unlucky?) people who find themselves in their vicinity salivate since, arguably, this is the instinct the smell of food triggers. Nonetheless, I'm convinced a grand gourmand perfume should offer more than a simple replica of food aromas. I mean who wants to smell like a sugar factory and risk being chased around by swarms of winged insects? Maybe the choice of aromas, their subsequent blending and a drop of abstraction might do the trick. 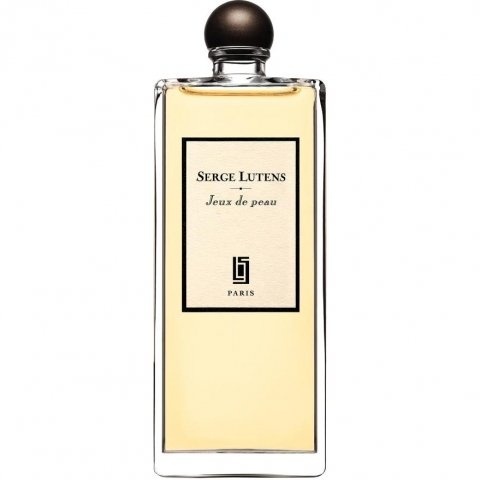 I've recently got my hands on several samples from the Serge Lutens line, including his take on the gourmand genre entitled “Jeux de Peau”. As I'm a massive fan of his brand, I was curious to smell how Lutens and his quasi-in-house perfumer Christopher Sheldrake tackled the food theme. “Jeux de Peau” opens with an aroma of bread. Not just any bread - this loaf has just been taken out of the baker's oven and cut into steaming slices. In an instant, butter is spread onto them, with the effect of creating a dense, milky background, which “Jeux de Peau” manages to retain for the rest of its development. Other notes that pop out of the mixture are sandalwood and a barely detectable peach note, bringing to mind a tad bit of fruit jam on a buttered slice of bread. There's supposed to be a whole host of other notes, but my untrained nose just can't pick them up. I'm glad to report the Lutens-Sheldrake collaboration led to the creation of a rather unconventional but perfectly delicious and expertly blended gourmand fragrance. What I enjoy most about “Jeux de Peau” is the fact that it makes me appreciate and savour the smell of such basic foodstuffs as bread, dairy products or jam, and thus reminds me of a frequently overlooked fact: that the best things in life are oftentimes the most commonplace ones. Yum! Where to start with this one? Serge Lutens - Jeux de Peau opens with a beautiful smell of bread yeast which turns into the smell of freshly baked buns straight out of the oven. It's a lovely smell, and it's light! It's not so heavy or "gourmandish" even though it's sweet. In other words, it can be worn anywhere at almost any time. It's true to it's name, which when translated means "skin games", as it plays and stays on the skin, never going too far or annoying anyone. I personally love it! Jeux de Peau opens with a host of gourmand notes. I get the wheat, the milk and the coconut, and liquorice in the background. It's very nice and pleasing. In the background I get hints of osmanthus blossom, which can smell a little like rice and a hint of apricot, and the use of an apricot note to compliment this side to the osmanthus is really great. The pairing of immortelle with liquorice is not a new one, as done before in Dior Collection Privée - Eau Noire, but here is is gentle and sweet, and compliments beautifully with the other notes. As usual, the base is made up of sandalwood, which is itself a very creamy or "milky" note, and we have seen this wood paired up with a real milk note before Hermèssence - Santal Massoïa. But here is has more substance and lasts longer. Overall, a wonderful warm and inviting fragrance, which doesn't offend in any way, smells very alluring, and which blends really well with the skin to make you smell delicious. If you like gourmands, you'll like this, and even if you don't, you'll still like this. That's the magic of this one! A nice perfume with a unique and quite lovely smell. Like a warm smell from a bakery in winter. Just wonderful! My food tastes have evolved since childhood but a few things remained. Like slowly finishing a whole baguette myself, whilst staring into space or reading a novel. I love the yeasty smell of the soft inner part of the baguette, the mild sweetness of the bread as I chew, the sound a fresh crusty baguette makes when broken into. It was and still is one of my comfort food. Jeux de Peau does the same for me. I can understand that the yeast accord would not suit everyone's taste but it suits my chemistry beautifully. I smell like the welcoming warmth of a good old-fashioned bakery in the middle of a frigid winter. The usual gourmand suspects like vanilla and chocolate are missing. Instead we have creamy milk, golden butter and of course bread. Like Heidi's breakfast with the Alm-Uncle on the Alps. Sillage is good and longevity decent, 6-8 hours. Not a safe blind buy but on the right person, this is as comforting as a big hug. Is it a new genre? The "woody yummy"? The opening is wonderful - loads of cedarwood and incense , but the heart is too much of a "gourmandise" fragrance for me: burnt almonds and buttered cookies. I don't get any licorice from this scent, neither do I smell apricot or osmanthus (all mentioned in the pyramide). On my skin, the fragrance dries down to a sweet almond dessert - probably much better worn in fall/winter than in the warmer season, provided you like this kind of "foody" style in fragrances. It certainly conveys a cosy atmosphere, but I must confess that I prefer other scents by SL to "Jeaux de Peau", which does not live up to its name. "Jeux" de peau? The plural "jeux" suggests a multi-layered, more complicated fragrance, but I perceive it as monotonous. "Woody yummy by Serge Lutens" is not quite my cup of tea.